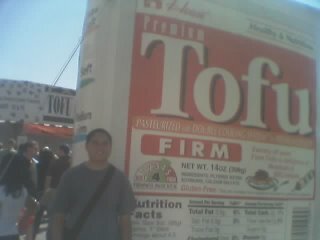 We attended the LA Tofu Festival yesterday in Little Tokyo. It was hot and crowded and there was a lot of good food to eat. My wife and I split 20 festival script tickets which cost $1 each. They can be traded at each booth for small portions of food, most of them consisting at least partly of tofu. There was tofu pizza, tofu skewers, tofu tostadas, tofu with noodles, tofu desserts, etc. etc.. The items ranged from 1 to 3 tickets, with most of them being 2. This is a little cheaper than I remember the food being (I went to the festival a few years ago). We got more than enough tickets. We were totally full with 4 tickets each to spare. We spent the remaining 4 on bottled water and a boba drink. I wish we could have spent more time there and in Little Tokyo in general. However we were kind of in a rush because we had to get home to pick up friends to go to Cinespia. Last night's movie was the original Psycho. 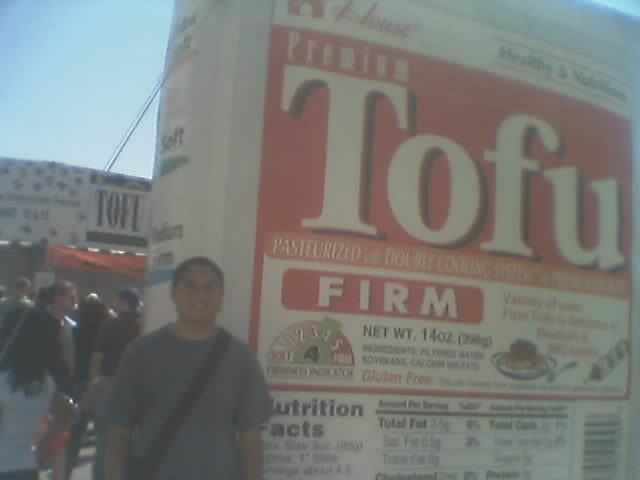 By the way, I love tofu!